We Van Meters are not Disney cruise type people. We are more at home in less luxurious settings, far from glitz and pampering, out in the open where we can enjoy each other’s geeky company in peace. 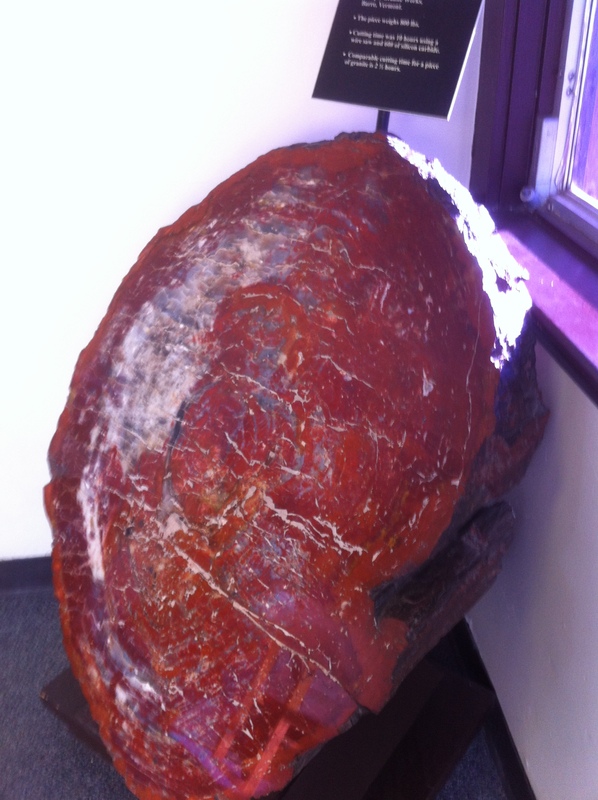 A slice of petrified wood from the museum at Petrified Forest National Park in Arizona. So it surprised no one when we decided that this year’s vacation would be a trip to the desert southwest. We braved high winds in Albuquerque, a dust storm in Las Cruces, NM, and snow–yes, snow–in Tucson. But Denise had time to unwind, and the boys had time to explore and experience things they’ve only read about. And I had time to think. The desert has sparked contemplation for centuries, especially for Christians seeking to know God more clearly than they could in the noisy, foggy, work-a-day world that most of us inhabit without question. In the open spaces, with nothing but silence and blue sky to press down on you, hearing God seems perhaps not easy, but at least more possible than it does in our cluttered normal lives. The lessons of the desert came in glimpses. After all, I still had to spend considerable time protecting the Saguaro cacti from my inquisitive children. During the in-between times–thirty seconds here, five minutes there–I considered the expanse of time and my minuscule place in it. That lesson came home in particular on the last day of the trip, when we hiked through Petrified Forest National Park. The “logs” in the park are the fossilized remains of Araucarioxylon arizonicum, a species of conifer from the late Triassic. These 200-ft-tall trees fell over 220 million years ago, when present-day Arizona was a lush forest not far from the equator. The trees were covered with sediment, and groundwater began the process of petrification. Geologically speaking, the transformation from wood to fossil happens in a blink–only 100 years or less. But that’s still quite an expanse of time when you’re part of the human race, a mere mortal with only a few decades in which to figure out such deep mysteries as are within our reach. Sometimes our days seem endless. In the desert, alongside such petrified wonders, they seem all too brief. Regardless of how we experience time, the fact is that real transformation can take years, whether we’re talking about fossilized trees or human spirits. God, it seems, is content to make changes in his creation bit by bit. For most of us who long to be made into the image of Christ, the process is far from instantaneous. God covers us with mercy, and his love moves through us, and little by little, his grace makes our lives solid and beautiful, worthy of admiration on earth and remembrance in heaven. Blessed is the world that we live in, and all the people we share it with, and all the goodness of God’s creation. I’m taking some time this week to ponder the blessedness of the world, and I hope you’ll make time to do the same. The full mondayspenny posts will resume next week. Nerd word of the day: parsimony. In common usage (as if any usage of a word like that is really “common”), parsimony means the quality of being stingy or cheap. We campus ministers consider it a virtue. But in a more specific sense, parsimony denotes economy of explanation. It’s a word often used in conjunction with Occam’s razor, a philosophical tool used to carve out the simplest explanation among many hypotheses. According to Occam’s razor—or the law of parsimony—the hypothesis that makes the fewest assumptions toward its solution should be given priority. Sound complicated? It really isn’t. The fancy words simply mean that we’re most likely to discover truth by pursuing the simplest path toward it. Occam’s razor is like the Pirates’ Code: it isn’t a law so much as it is a guiding principle. But it has wide application, from science to theology to math to carpentry. And more often than not, it works. Much of my adult Christian life has been punctuated by a struggle with prayer. I’ve read books that offer methods for praying, and others that decry such technological approaches. I’ve tried to define it through research and through observation. I’ve asked a lot of questions and not come up with too many answers. More than that, I’ve found the act of praying itself very difficult, especially when I approach the subject without a guide. My own extemporaneous prayers tend to be a garble of platitudes and shopping lists. How on earth can I ever expect to be made perfect in love when I can’t even get off the starting line in terms of prayer? Lately, however, I’ve remembered again what I’ve always known to be true, even though I ignore it: that simple prayer is the best kind. Perhaps those formulaic prayers don’t have the same passionate cries of extemporaneous prayers; they certainly don’t convey passion in any of the normal American forms. But they remind me of a few key things. Prayer is about openness to God, not about giving orders. The divine connection in prayer happens independent of my emotional state. The more complicated I make prayer, the greater the likelihood that I will get in my own way. Simple prayer is often the best prayer. Thank God for the CUMC youth’s prayer bracelet, and for Occam’s reminder.